We welcome our new supplier Forte Flooring with open arms, a 3rd generation family business with over 25 years experience in the timber flooring industry. They provide high quality engineered hard flooring and wall coverings in the latest European styles, helping us help you create beautiful long lasting interiors. You can view the full selection of Forte flooring HERE or look out for the 2017 current timber flooring trends HERE. Why would you choose engineered timber flooring? There is something about the feeling of wood in the home, it naturally delivers character and a sense of solidity while at the same time brings warmth and timeless enduring beauty to your home. 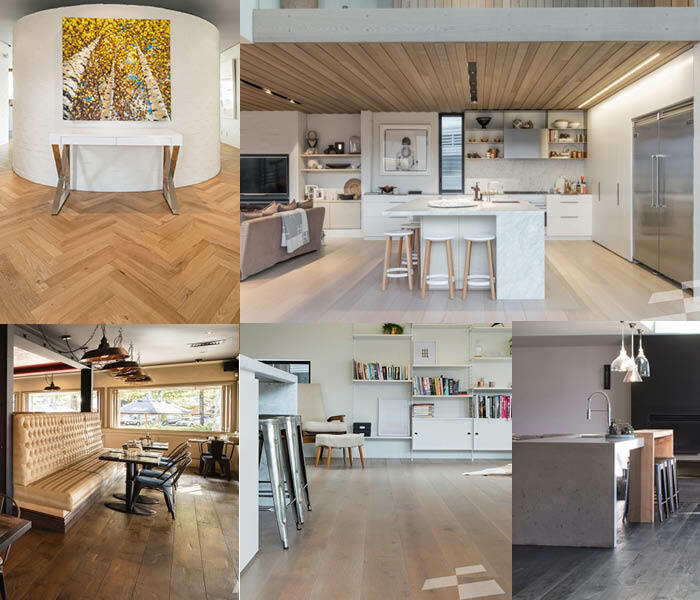 Engineered timber flooring can deliver many different looks and styles from pale pure Scandinavian style, rich natural warm classic, chic geometric herringbone and chevron patterns, or the darker modern, industrial or rustic raw looks. Engineered Flooring is available as unfinished boards to allow you the choice and flexibility to colour and seal as you desire in situ or in a variety of gorgeous prefinished colours. Engineered timber flooring is also not only just for floors, we use it for feature walls, ceilings, internal joinery, bar and kitchen counters,stairs and more. There are styles designed just for walls like Fortes artistic 3D Helm panels made from timbers salvaged from old boats and their striking Tactile T&G saw marked oak panelling. Engineered flooring is the timber flooring of the future, being much more stable and moisture resistant than solid timber flooring it is engineered not to shrink, warp, cup and bow. With our NZ home’s which love to make the most of our gorgeous natural views and outdoors with floor to ceiling glazing, engineered timber flooring is designed to better handle our environmental conditions and UV light exposure. The installation of Engineered timber flooring is quick and efficient as the boards come as micro-gaged T&G boards either with a prefinished or pre-sanded unfinished surface ready to be installed. At surfacedesign we select engineered timber flooring which is specifically designed and warrantied to be glued directly to concrete or timber flooring substrates to ensure long term stability, durability, performance, ease of maintenance and the option to use with underfloor heating. Engineered timber flooring only uses approximately 1/3rd of the amount of solid hardwood resource compared to solid timber. With engineered timber, the surface wear layer, which is able to be sanded is made of solid hardwood timber. In comparison, solid timber flooring is made up of 100% solid hardwood, 2/3rds of which will never be seen as it is located below the tongue-an area which cannot be sanded back. Fortes timber flooring products are manufactured using non-controversial hardwood timbers and carefully sourced sustainable hardwood timbers. Come in and see us at surfacedesign to view our wonderful range of quality engineered timber flooring products on display available to finish your home.